What and where did you like to read as a child? I read in secret places, up in a tree, or inside the lilac bush—my own private world—no interruption of my thoughts and dreams. I loved child heroines and heroes who had brave adventures even though they were scared or unsure of themselves. The Wonderful Flight to the Mushroom Planet, then as a teen Lost Horizon and Green Mansions. Lord of the Flies completely creeped me out. The Color Purple—the story is so universal and the writing so raw and real and personal and empowering. I cried through the entire first read. What was it that brought you to writing? I’ve always used writing for self-exploration and personal growth. Writing accesses a part of my brain that thinking and speaking do not. Word origins and definitions fascinate me—dictionary-ing is a daily sport for me. Writing increases my ability to articulate in speech. The ecological and spiritual collapse that happened when our first farm was bulldozed has been the most powerful lesson of my life. It needed to be shared. 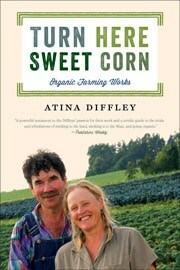 Readers gain a deeper understanding of farming in general and organic in particular through the story. I want the world to know that organic farming works, it is based on renewable, biological processes, and it is necessary for our food future. It is crucial that we support it. Young women farmers and kids were my inspiration. I love the phrase “the adjacent possible.” By reading another’s challenges and successes the not-previously-thought-of or seemingly-impossible, becomes untapped-potential-of-what-could-be. How do you write? Do you have a daily routine? What’s good, bad, and ugly about the process? Each stage of the writing process is unique. I’ve learned how important it is to trust the process. I often feel like the story is writing itself and I am the steering wheel applying the craft. In the early stages I free write and collect the material that comes to me—trusting the creative process and my unconscious mind to bring forward the relevant. Memory is not time linear. Writing one experience will stimulate another that can seem unrelated. For Turn Here Sweet Corn, I wrote 300 of these scenes without any outline or structure. When I have a large volume of material I put it in order and write connections between the pieces. This is when the inner story comes out and I start to understand what the deeper meaning is. Often I don’t know what it’s really about until after it is finished. If I want to get at a memory that is unclear, I visualize the part that I can remember, noticing colors or smells, focusing on sensory elements, then I rock forward and back while I write the part in detail. Buried memory will often follow out through the writing. My mind spits out “crucial” phrases and ideas usually at inconvenient times, and despite my best intentions I rarely seem to have my little notebook when I need it, so they end up on scraps of paper. This is exciting and stimulating, but after months of it exhausting. I need time off from it—periods with a “peaceful” mind. If I get stuck or my self-critic slips in, I put on a record and dance. Often the answer is in the first song that comes on. Eddie Rabbit’s, I Love A Rainy Night, brought my memory of the first rain after the 1988 drought, and Rocks Into Sand, by Bill Kirchen, inspired writing on the geological process of soil formation. Different positions and locations can stimulate a new perspective. I repeatedly expand and contract the writing. This process brings in the best material and distills it to a tighter essence. Save all drafts! I love what I think of as combing the writing during the edit process. I may put all of the writing on one character, or topic, or object together and check how it progresses emotionally and visually out of the context of the whole draft. I’ll go through the entire piece looking at last and first sentences of chapters and paragraphs. Structuring sentence lengths are fun. I comb the writing from every direction and perspective. I love finding the key turning points and editing and revising them. I am perfectly happy spending days tightening the language on a single page. What did you have to unlearn, un-believe about yourself to find your truth as a writer? What had to go? I decided in high school that I couldn’t write as good as John Steinbeck. This prevented me until I realized, I could and should write like me. What does beginning feel like? What does finishing look like? Is it harder than starting? Is there a part of you that doesn’t want to let go? Beginning Turn Here required accepting vulnerability and public exposure. I had to accept that once out of my hands the story would have a life and a relationship of it’s own with readers and I wouldn’t have any control over their interpretation. I was also uncomfortable with the idea that readers might lock me into one way of being. After a while that became unimportant to me. I know a piece is done when one of two things happen, my mind stops sending me things, or the writing becomes tightly woven and I can’t find a way to slip things in. I’m okay with it not be absolutely 100% perfect. I’m a human. There are things I would change in Turn Here Sweet Corn if I had another go through it, but it’s not important. How did you find the publisher for this book? Every author’s dream! I asked writer Beth Dooley to mentor me in the writing process and she was beyond wonderful—a regular fairy godmother. Encouraging me when I was discouraged, sending just the right article at the right time, suggestions on craft, and writing feedback. She arranged for me to meet her editor at the U of M Press, Todd Orjala. I sent him a draft and three months later he emailed a contract. I never wrote a query letter or a book proposal. May the stars align again! Do you have any particular story to tell concerning the writing of this book? An incredible gift that came from the memory writing was I re-experienced how I felt when they happened, and what I had decided at the time. In the process I found beliefs from very young, that I was still—some four and five decades later—holding onto as if they were true. I was allowing a child’s experience to dictate my mid-life self. Writing Turn Here Sweet Corn became an opportunity to reevaluate my life and bring my self-beliefs up to the present reality. I am a healthier person now than when I started it. What advice have you received concerning writing? What advice would you offer young writers? The inner story will come out through the editing process. Just write and be sure you include three things: what happened, how the characters felt then, and how they feel now. The reader needs to see change in the characters. As you move through the editing process and focus on the events and the narrative arch an amazing thing happens—the inner story reveals itself. Sometimes I have to write something that is in the way. I may not use it in the finished book but it needs to be understood for the other writing to come. It is common that I’ll have two scenes side by side and I don’t have a clue what they have to do with each other, they seem completely unrelated, but my writing self insists they belong together, then in the process of editing it becomes completely obvious how they are related. I allow my intuitive and sub-conscious a good deal of leeway. Sometimes I’ll delete something just to experiment with a different perspective. I file all deleted material. I can always bring it back if the writing calls for it. Write a letter to your inner critic. Give him or her a name, thank her for all she’s done for you, and tell her what her role will be during the writing process. Mine was given a vacation. You can be your own best friend, or your worst critic. Choose the one that is most beneficial.